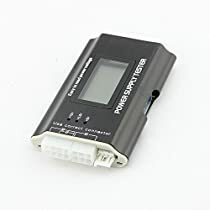 Test your power supply and avoid damage to expensive computer equipment with this ATX, BTX and ITX power supply tester which has a large LCD screen, making it even easier for you to check data. Simply plug the tester in to your power supply? 20/24 pin female Molex connector and the LED lights and buzzer will indicate how safe your supply actually is. Dimensions: 12.5 x 6 x 2cm (5 x 2.5 x 0.7 ?